Online marketing is ever-evolving, so it’s important to make an effort to educate yourself, participate in conversations, and share new ideas. 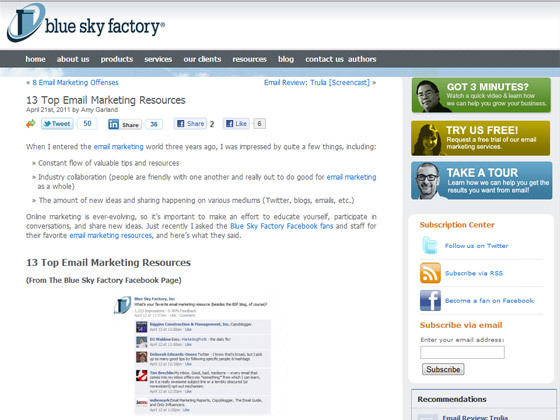 Just recently I asked the Blue Sky Factory Facebook fans and staff for their favorite email marketing resources, and here’s what they said. 1. Copyblogger. Copyblogger is a great resource for online marketers in general, but often posts articles specific to improving your email marketing campaigns. In their own words, Copyblogger is all about helping you: get traffic, attract links, gain subscribers, and sell stuff. 2. My Inbox. This was my favorite answer and a resource that I often recommend. Tim Brechlin said “every email that comes into my inbox offers me something from which I can learn, be it a really awesome subject line or a terribly obscured (or non-existent) opt-out mechanism.” So true! Subscribe to as many emails as you can, and study them to see what you like and what you don’t like. Which entice you to actually open, click through, and/or convert? Which make you want to instantly unsubscribe? Learn from your fellow email marketers, and use this knowledge to help better your own campaigns. 3. Twitter. Join the conversation on Twitter. Start following other email marketers and those who work at ISPs, email service providers, and more. Get started with a list like this one. Don’t be shy! Start talking, asking questions, and sharing resources. 4. Only Influencers. This is a private network for digital marketers; membership is by invitation only. I’m not a member, but a few co-workers (DJ Waldow & Greg Cangialosi) are, and I’ve heard nothing but good things about this group! Thanks to Riggins Construction & Management, Indiemark, Deborah Edwards-Ono, and Tim Brechlin for chiming in on Facebook! 5. Email Marketing Reports. If you’re short on time and can only catch up with one feed in your Google Reader, check out Email Marketing Reports (EMR). Written by Mark Brownlow, Email Marketing Reports gives advice, information, and tips on topics from automation to mobile emails and everything in between. 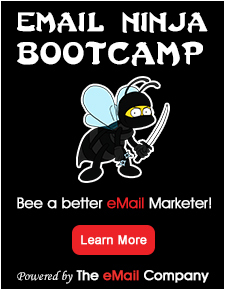 EMR is a great guide for new email marketers and seasoned veterans. 6. Emails Standards Project. The Email Standards Project is about working with email client developers and the design community to improve web standards support and accessibility in email. This site is highly recommended by the Blue Sky Factory Creative and Support teams, and is extremely helpful for learning how emails render in different clients.